The most commonly used alternative name of the plant family, "chile", is of Mexican origin, from the Nahuatl word chilli or xilli. Bell peppers are botanically fruits, but are generally considered in culinary contexts to be vegetables. than your daily quota of Vitamin A and C! is concentrated in the red variety. Most of the differences in bell pepper color stem from it's degree of ripening. Green peppers are bell peppers that have been harvested before being allowed to fully ripen. While green bell peppers usually turn yellow-orange and then red this is not always the case. Red, orange, and yellow bell peppers are always more ripe than green ones and therefore require more time in the ground before they can be harvested; that's why they are more expensive. Bottom line: all of the bell peppers originate from the same species of plant, and they achieve their different colors naturally, not by any artificial means. It's interesting to note that in addition to their unique colors, each differently hued bell pepper has a unique array of nutritional benefits. Green peppers feature an abundance of chlorophyll. 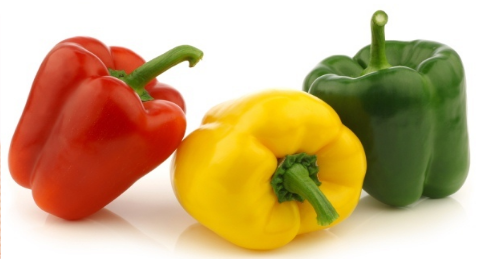 Yellow peppers have more of the lutein and zeaxanthin carotenoids. Orange peppers have more alpha-, beta-, and gamma-carotene. Red peppers have more lycopene and astaxanthin, two other important carotenoids.